End All Your Suffering With Buddha’s Noble 8-Fold Path. It is the right way of looking at life, nature, and the world as they really are. It is to understand how reality works. It acts as the reasoning for someone to start practicing the path. It explains the reasons for life existence, suffering, sickness, aging, death, the existence of greed, hatred, and delusion. It gives direction and efficacy to the other seven path factors. In this factor, the practitioner should constantly aspire to rid themselves of whatever qualities they know to be wrong and immoral. These are.. Intention of all living beings’ happiness. III. intention of avoid harming all living beings. Right speech deals with the way in which a Buddhist practitioner would best make use of their words. what is right speech? IV.Abandoning idle chatter… He speaks in season, speaks what is factual. Right action can also be translated as “right conduct”. As such, the practitioner should train oneself to be morally upright in one’s activities, not acting in ways that would be corrupt or bring harm to oneself or to others. I.Business in weapons: trading in all kinds of weapons and instruments for killing. II.Business in beings: slave trading, prostitution, or the buying and selling of children or adults n animals. III.Business in meat: “meat” refers to the bodies of beings after they are killed. This includes breeding animals for slaughter. IV.Business in intoxicants: manufacturing or selling intoxicating drinks or addictive drugs. V.Business in poison: producing or trading in any kind of poison or a toxic product designed to kill. In this factor, the practitioners should make a persisting effort to abandon all the wrong and harmful thoughts, words, and deeds. The practitioner should instead be persisting in giving rise to what would be good and useful to themselves and others in their thoughts, words, and deeds, without a thought for the difficulty or weariness involved. Here, practitioners should constantly keep their minds alert to phenomena that affect the body and mind. They should be mindful and deliberate. I. focused on the body in and of itself—aware, and mindful—putting away greed and distress with reference to the world. II.focused on feelings in and of themselves—aware, and mindful—putting away greed and distress with reference to the world. III. focused on the mind in and of itself—aware, and mindful—putting away greed and distress with reference to the world. IV. focused on mental qualities in and of themselves—aware, and mindful—putting away greed and distress with reference to the world. is the practice of concentration ,It is also known as right meditation as such, the practitioner concentrates on an object of attention until reaching full concentration and a state of meditative absorption. the practice of samadhi can be developed through mindfulness of breathing (anapanasati), through visual objects (kasina), and through repetition of phrases (mantra) and Vipassana. This leads to self-awakening. 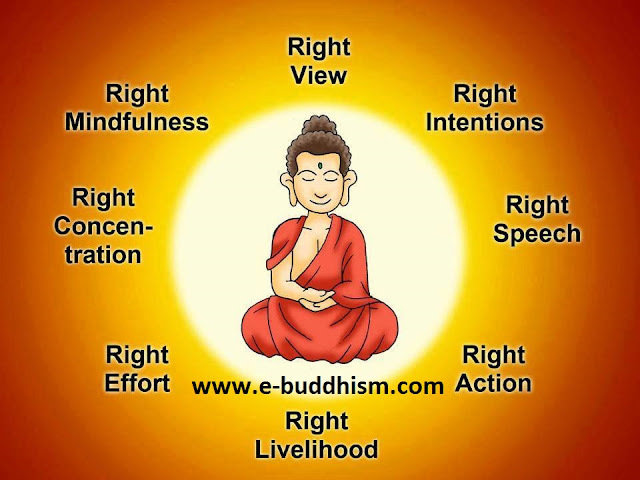 During the practice of right concentration, the practitioner will need to investigate and verify their right view. In the process right knowledge will arise.